The backstory of when the first half of the caldron is uncovered is acted-out very convincingly, along with the revelation that a dark queen was put in the container along with the blood of her victims and, in a magical ceremony, brought back… changed. Her name on the caldron has been carefully scratched-out. The diarist fled the house, leaving a warning. So, who is the dark queen, the obvious vampire of the piece? The mother or the daughter? Or neither? When Isabelle fully reveals the second half of the antique, Karl insists it cannot be removed from the house. He instructs that the first half should be sent down to the house (a recipe for disaster, I would have thought!). The two halves match, as expected, but now a dark figure is seen in the house, and Isabelle has seen too much… Karl, his wife and daughter believe they are promised immortality, but these things never pan out. Isabelle is assigned a room in a part of the house which doesn’t have electricity, and given a torch! This is a rather contrived manner of creating atmosphere where there would perhaps be none. Isabelle also falls for the oldest trick in the book with a drugged drink, when she suspects Karl is up to something. I would say, however, that the good points outweigh the bad. Brian Croucher is very good as Ezekiel the necromancer in the black and white filmed opener. Neil Morrissey is convincing as the gardener, too, although he is woefully underutilised. The shaking camera techniques and quick cuts emphasise the general feeling of unease, as does the atmospheric and enhancing soundtrack by Michelle Bee. 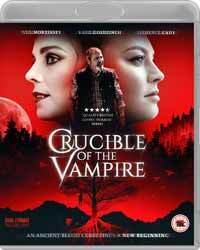 It’s far from perfect, but Crucible of the Vampire does focus on the characters and how they relate to events, rather than focussing on the ‘monster’ of the piece – which is how it should be. It’s an entertaining film to watch, and a promising progression by co-writer and director Iain Ross-McNamee.